The last time Once Upon A Time aired, I think it was a month ago or something like that since their scheduling has been awful this year, I had just about fully had it. Officially. From the absurdity of Tamara’s tazer to the god-awful ‘happy ending’ for August that tore Eion Bailey from our screens, this show worked against my nerves with hardly a decent outing since ‘The Miller’s Daughter’. So when it came to be that ‘Lacey’ was going to feature one of the things I’ve truly come to despise—the Rumbelle forcing—I dreaded the return of OUAT. Now that I’ve seen it, I’m surprised to find that I didn’t actually want to blind myself during like I thought I may want to. There was a clever deviousness in Regina’s plan to change Belle that redeemed her action from being on the surface, at the emotional level of a slighted teenage girl. At first it seemed that Regina was lashing out at Mr. Gold purely because of the fact that he could hang out with the get-along gang, which includes her adopted son Henry, now that his parentage has been revealed to hold a link to Gold himself. Becoming yet another chapter in the ongoing saga of Henry’s custody, aka the absolute most dreadful storyline on this series. While it may partly have been to do with that, what Regina was really doing was taking so much more away from Gold than the lady he loved a long time ago in a land far far away—she took away his chance at a moral high ground and twisted him to her own intentions without him fully realizing it. Magic is akin to a drug in this world and in the Enchanted Kingdom. Regina and Rumple both have been supposed victims to its smoky destructive allure, and both of their relationships with magic have helped mold them into the people they are today. In Mr. Gold’s case, when we see him use magic, specifically dark magic, it’s constantly portrayed as a slip from a moment of weakness or of wanting something without putting any work into it. But there’s an argument to be made that though there might be good in him at times, that does not a ‘good’ person make. 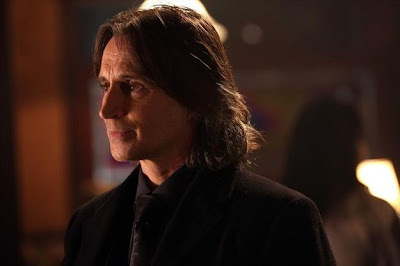 Tonight proved to me that the put-on of a patient, kind, and good Mr. Gold has always been Rumple living a lie. Much of Rumple’s personality is affected by others. His quest to prove himself anything but a coward was spurred forth by the rebuke of his wife Mira and the loss of respect from his son Baelfire. When he became the Dark One, Rumple achieved respect but not love and so in order to experience love again he found his actions being influenced greatly by the pure-hearted Belle. Though I’m no fan of present-day Rumbelle interactions, I do have to say that I thought the Beauty and the Beast parallel came through better in this episode than in any before it. Something really popped in their chemistry during the Robin Hood chapter of their story (make no mistake it’s far easier to refer to any new side character as a page in a main character’s story which is a complaint for another blog post another time) that never comes through in present-day Storybrooke. 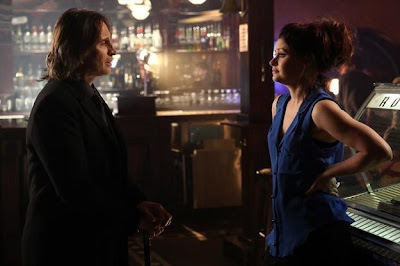 Now let’s talk about Lacey and Mr. Gold—two Storybrooke personas seeing if they’ve got a spark. Lacey is the curse version of Belle we never got to know in the first season since when we met her, she was locked up in a mental ward. Lacey is a bit brash, a bit boozy, and she has no problem with going after what she wants when she wants it. On paper that sounds about as effective as ‘fun’ humanity switched-off Elena on The Vampire Diaries, but it’s surprisingly it plays more like a woman who is finding herself in a modern world—casting off the image and constraints of that well-known golden dress. Yes, Regina created Lacey and it’s not the ‘real’ Belle but it seems to me that she’s a lot more independent than Belle was. It was disheartening to see real Belle go after Gold in this world because it wasn’t real. The tale of Beauty and the Beast exists perfectly in the context of a certain time and place. In the modern world, Gold and Belle just do not work together. A large part of that is due to the fact that Gold has to put on an act for Belle. I don’t think he’s the devil incarnate but it’s worth noting that every time he gets the chance to be a little vindictive or embrace his dark powers, Gold goes for it with gusto. Watching Lacey look on more than a little lustfully as Mr. Gold proceeded to show her a taste of his inner darkness felt more authentic than anything that regular Belle has done with Gold in the quiet Maine town. Is it moral? No, but it’s entertaining, and my God does this show ever need more than a hint of the dark stuff from time to time. So if Mr. Gold gets his inner Dark One on again then Regina not only bested Rumple morally but she also has an agent of chaos of sorts in the town that could prove the perfect distraction while she enacts her own more personal form of revenge. 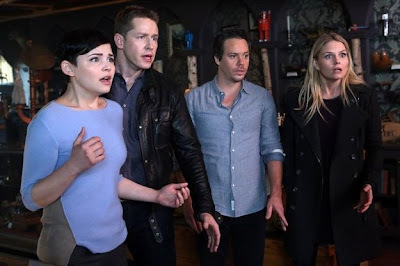 Outside of focusing on achieving true love by any means necessary because you’ve lost one of your prized ‘things’, everyone is more concerned with the drama of themselves or others despite the fact something wicked is going to befall Storybrooke. Danger is closing in on the inhabitants of this town, and they’re really not doing enough to prepare. Sure, no one seems to realize Tamara’s whole thing (or the fact she’s with Greg) but a warning from real boy August should have had Emma a little more suspicious about what he referred to. Instead, she was caught up in her parents and their want to grow magic beans so they could return home and restore their kingdom. To me, it makes perfect sense that they wouldn’t just abandon their kingdom to stay here now that the curse is over with. This place is not, nor was it ever truly, their home. But pushing Emma just because they don’t want to leave her again is a little selfish of the Charmings. I’m aware they didn’t get to spend a lot of time with their daughter but she’s an adult so it’s going to be her choice whether or not she wants to stay in this world or go with them back to the realm. I doubt it would be possible to live a very normal life after you’ve fought dragons and ogres though so perhaps her mind will be made up easier than we think. This is all assuming that Hook doesn’t mess everything up though. I’m not terribly sure what Tamara and Greg think they’ll do with him, but I can’t say I didn’t love the image of Colin O’Donoghue bound and helpless. I think that was the best happy ending the show’s given its viewers in a long while.